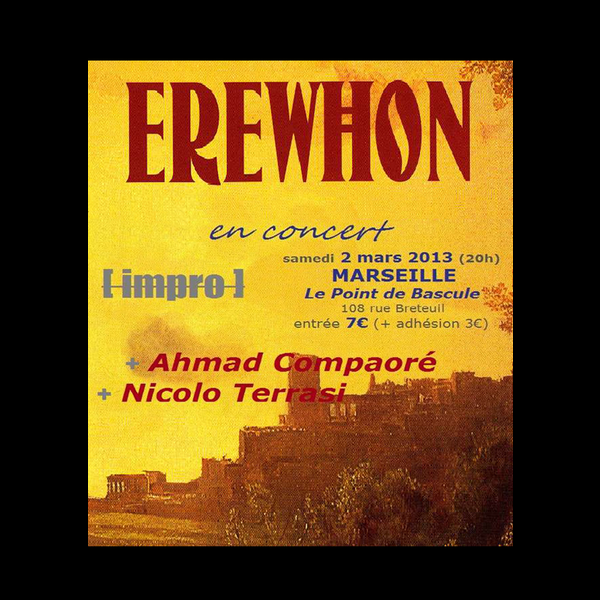 The ensemble Erewhon is back in Marseille, with 2 solos as evening opener (drums/percussion/sampler & classical guitar). 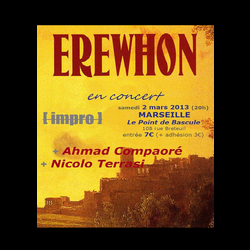 A multi-faceted ensemble, Erewhon elaborates improvised chamber music, all-terrain, without borders... Somewhere between spectral music and free jazz, Erewhon indulges in instantaneous creation and oversteps the mark. With a craving for exploration, drummer Ahmad Compaoré equally enjoys the most extreme experiences in alternative and improvised music, jazz and fusion. Free from boundaries, his play expresses all the emotion of a music of freedom. Playing classical guitar, Nicolo Terrasi presents a programme influenced by popular music, mixing modern pieces (Ohana, Gismonti) and improvisation. Organic food on the premises. Parking opposite (impasse Montévidéo).